Nike is an American multifunctional corporation which is founded in the year 1964. Original name of this company was Blue Ribbon Sports which was changed in 1971, borrowing name “Nike” from the Greek goddess of victory. Today Nike is one of the world’s largest suppliers of athletic shoes and apparel and a major manufacturer of sports equipment. Nike is designing, developing, manufacturing and marketing sports footwear, apparel, equipment, accessories and services. This Nike Closed Patella Knee Sleeve can be used during physical activities such as running, weightlifting, basketball and other similar activities which are connected with constant or frequent load on knees. Usage of this knee sleeve provides knee and its structures support and protection against such knee injuries as strains, sprains, pulls and fatigue, because this sleeve has compression functions which ensures stability and warmth, preventing knee damages. This Nike knee sleeve has many different features. One of these features is elastic construction which ensures easy pulling on, individual conformation, mobility and comfort. This product is unbelievably lightweight and thus comfortable, because it is made of light materials such as polyester, spandex and nylon. This sleeve has strategically placed mesh ventilation zones which ensure constant airflow and quick-drying comfort, therefore, the skin and joints stay cool and dry, despite the intensity of game. Because of its lightness and breathability you probably think that they do not provide sufficient support, but these features do not reduce the effectiveness of support. Considering that this Nike product is knee sleeve, it has compression fit and functions – it supports and stables the knee, and warms its structures, preventing different knee injuries, for example, pulls and fatigue caused by insufficient warm-up. It also has flat seams for minimizing chafing during physical activities. 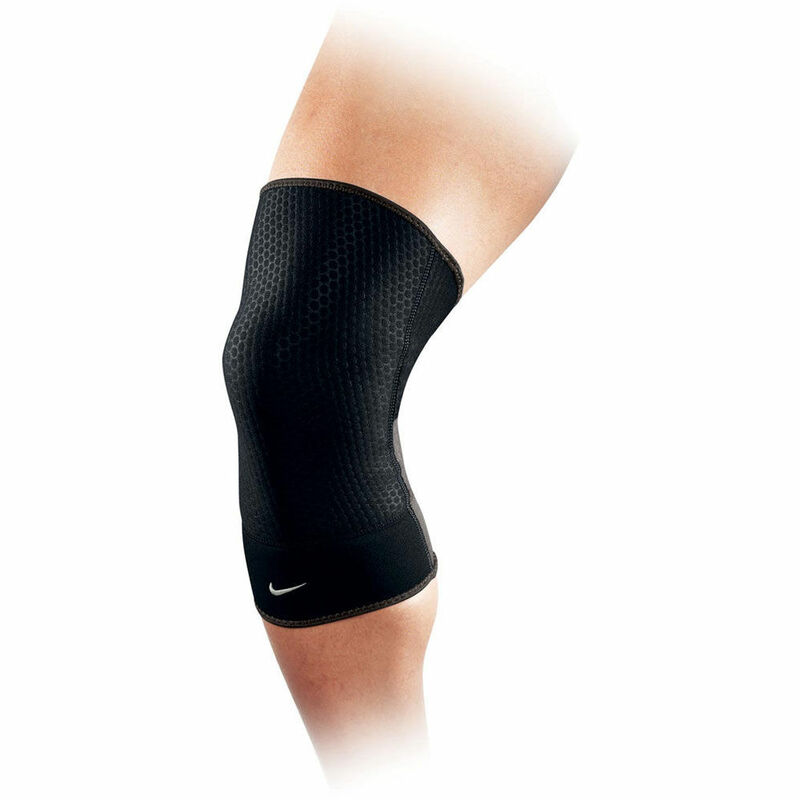 This Nike Closed Patella Knee Sleeve is available in two colors – black and dark charcoal color. It is made of patterned fabric which gives it interesting and extraordinary look. It also has mesh ventilation zones behind the knee which offers stylish look. This knee sleeve has flat seams and light gray seams on the top and bottom of sleeve. Another feature of this sleeve is white embroidered Swoosh logo on bottom. This Nike Closed Patella Knee Sleeve is meant for knee support and protection during such physical activities as running, weightlifting, basketball and other similar activities which are connected with constant load on knees to avoid different knee damages. It is made of polyester, spandex and nylon and it comes in black and dark charcoal color. This Nike knee sleeve is available in four different sizes – S, M, L, XL – so it is suitable both for adults and youngsters, unless their leg dimensions are appropriate to given sizes. This product has many features, for example, elastic construction, easy pull-on design, lightness, mesh vents, breathability, compression fit and flat seams. It can be washed in washing machine and usually it is sold as single, therefore, if you need protection and support for both of your knees, you have to buy two of them.